Mccoy Teas: How much caffeine is there in English breakfast Tea? English breakfast tea, also known as English tea, is a blend of different black teas from various regions. It is rarely a single-origin tea and the flavor is defined by its characteristics rather than its ingredients. The common types of black tea used to make an English breakfast tea are Ceylon tea from Sri Lanka, tea from Kenya, Assam from India, and sometimes Keemun from China. The Ceylon tea is one of the pure teas that resembles the more modern English breakfast tea. The name “English breakfast tea” is believed to have originated from being accompanied after a traditional English breakfast, which was often rich and heavy. It is said the tea’s strong flavor helped the drinker feel more productive and alert in the mornings after such a hearty breakfast. 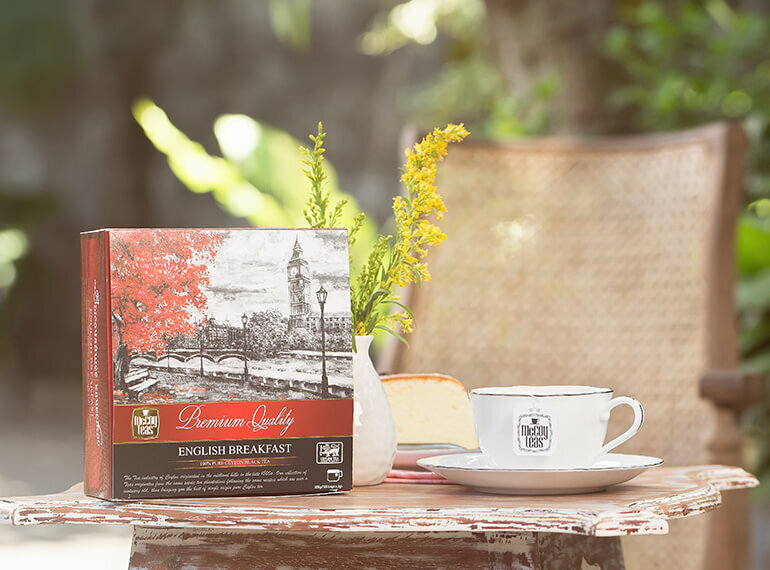 Nowadays, though, English breakfast tea can be enjoyed at any time of the day. English breakfast tea does not have additional sugar added to it. The caffeine content of its total weight is 3.4%, a significant amount when compared with other teas. Compared with coffee, the caffeine content of English breakfast tea is about one-third to one-half. Black tea contains 40-70 milligrams of caffeine per 8-ounce cup; therefore, consuming English breakfast tea is considerably safer since it is approximately half the amount of caffeine found in a cup of coffee. To compare, it would take about nine cups of English Breakfast tea to reach the recommended cap level of 400mg. However, as with all things, consummation in excess is recommended to be avoided. Though caffeine temporarily increases sympathetic tone (mild increase in blood pressure, increased heart rate), it does not increase risk of heart disease. But if you’re concerned about caffeine content without wishing to cease drinking English breakfast tea, one way to control the level of caffeine produced by the tea is to reduce the steep time. The shorter the steep time, the less caffeine will be produced when the brewing is finished. For instance, steeping an English breakfast tea for a single minute reduces the caffeine intake to about 14 milligrams per cup. If you steep for three minutes, it gives about 22 milligrams, and a full five-minute steep will produce the usual 42 milligrams of caffeine, though it can also result in a more intense flavor that is enjoyed by tea enthusiasts. However, it is advised to avoid an extended steeping as this can produce a bitter taste. English breakfast tea offers various health benefits, preventing cavities from developing and believed to support dental health overall. It is also believed to lower blood pressure, and, since English breakfast tea is essentially calorie-free (though a 6-ounce cup contains about 65 milligrams of potassium, and small amounts of phosphorus and magnesium), an aid to those who wish to reduce their daily calorie intake. In summary, English breakfast tea does not contain a high caffeine content compared with other teas, and can therefore be consumed in moderate quantities per day.